It appears that Ellie Robison was the first President of HHHART (it probably wasn't called that yet). As far as we can tell she started this retiree group in 1982. Ellie was president for about three years. Ralph Abbott took over in 1984 (he retired that year so it might have been early 1985). Joan Petroske became president in 1993 at Ralph's request. According to Joan, Ralph and Ed Petroske wrote the Constitution together. At the General Meeting/Luncheon at the Stonebridge Country Club the HHHART Constitution was ratified. The last time it was visited was in 1993. Click Here to view our constitution. The 2013 NYSUT journalism competition winners have been announced. There are categories for both retirees and in-service communications and writing efforts. 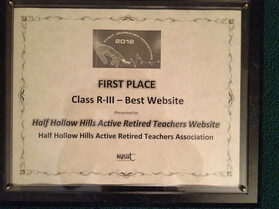 Our website took first in its class! All winners will be recognized during the NYSUT Journalism Awards Luncheon on Saturday, April 27 at The Hilton Garden Inn, Troy. This year, the "Best of the Best" and Solidarity winners will be announced at the awards luncheon. 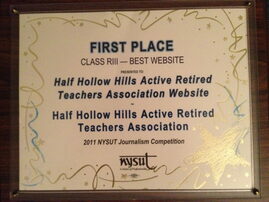 At the annual NYSUT Journalism Conference the hhhart line was once again honored with a first place in its category. Two years in a row! Each year NYSUT honors the exemplar publications of active and retired teachers. A panel of accomplished judges view and discuss all entrants. In the R-111 category, this website was awarded first place. To view the acceptance of the award, click here. The judges commented, "This appears to be a start-up site, and it has great potential, with excellent use of graphics, photos and news blogs. All very helpful and very accessible." We are very proud of our website and look forward to another year representing our union.